Scott Ellis: Welcome to the Frisco Podcast. 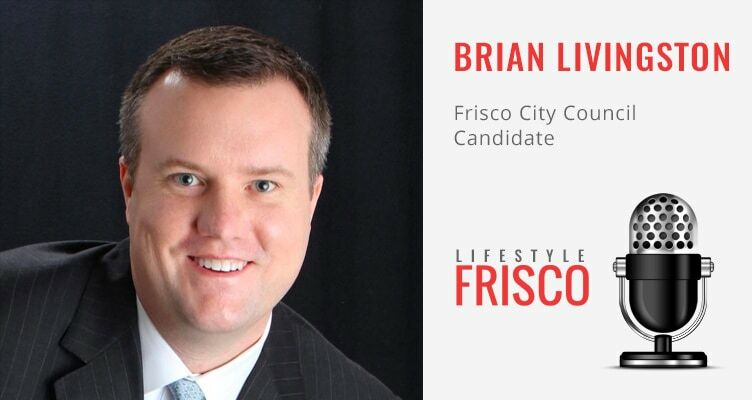 I’m your host, Scott Ellis, and today, we are going to get to know Brian Livingston, Frisco City Council candidate for place six. All right, Brian Livingston, welcome to the show. We’re glad to have you on the Frisco Podcast. Brian Livingston: Thanks for having me. Scott Ellis: I think we all know that there is yet another election coming up. There is a runoff election. You are running for place six for Frisco City Council. This has been a long journey for you guys, hasn’t it? Brian Livingston: It has been. I started my campaign on September 23rd. It’s been a couple months for me. Scott Ellis: All right. Well, hopefully, we’ll be rounding this out very soon. For everybody’s benefit, the election itself is on June 10. That is 1-0, 10. We’ll remind you of early election dates, and all that good stuff, here coming up shortly. In the meantime, Brian, we want to get to know you a little bit better, as we head into this, hopefully, final election for a little while. Tell us a little bit about you. How long have you been in Frisco? What do you do here, outside of running for City Council? Brian Livingston: I have lived in Frisco for seven years. We moved from Plano. I have two daughters, eight and five. Pardon me, just turned six. Eight and six. They go to Carroll Elementary. My wife and I own and operate Celebrity Café and Bakery, all six locations, and we also own and operation the Texadelphias in Frisco and Plano, and some other small businesses that we operate out of Frisco, as well. Scott Ellis: Very good, so you’re making all the yummy stuff for us to chow down on. Brian Livingston: I am. I was just taking back a look, beginning of the campaign ’til now is just the story of me getting heavier. Scott Ellis: I understand. Well, when you’re that busy, sometimes it hard to squeeze in a workout, but we hope you’ll try. We have a number of issues facing Frisco right now, and some of these are common themes, that we hear from our audience, that we observe in the conversations that they have, so I want to talk a little bit a couple of those and get your take on them and get a sense for where you stand. One of the big ones, and probably the biggest one, no pun intended, is growth. How big does Frisco get? We’ve heard numbers that are anywhere from around 275,000 to 375,000. Some have even suggested higher. A lot of people have different opinions on growth. What is your take on how we’re managing that, how we should be managing that, and where would you like to see Frisco end up? Brian Livingston: I’d like to see Frisco end up how we originally had planned, in the 275,000, 280,000 people. I think we’re doing a decent job of it, but I think people need to remember that we’re about to get hit with a lot of growth. The Star’s only roughly 40, 45% complete. The other developments around it, The Gate, and the other stuff, hasn’t even started yet. We need to realize that when that happens, it’s going to be an influx of more people, more cars, more traffic, like we’re seeing down at Legacy and 121 and Legacy West. I’m afraid we’re not prepared for that. I’d like to see more of a focus put on traffic and decreasing congestion before we have all the people come in. Expanding the right turn lanes, broadening some lanes, like at Legacy and 121, to allow traffic to move better. I talk to our fire and police a lot. Our police are already understaffed 30 people. Our fire’s understaffed in the mid 20’s. I don’t ever want to fall behind in those areas, because once you do, it’s very hard to catch up with growth plus trying to get the base that you needed to stay with. I think we’re doing okay, but I think we need to realize we’re about to get hit with a big influx. I’d like to start making sure our infrastructure can handle it now, versus when all this stuff hits. Scott Ellis: Yeah, it would definitely be nice to get ahead of the curve. It seems like roads and things like that are always a little behind what’s happening. I’m glad you’re thinking about that. Are there any particular initiatives you know about, or things that maybe you’re a champion of, that would be helpful in that regard? Brian Livingston: Well, I’m a fan of doing stuff that’s easy and less expensive to start with, instead of just throwing money at a problem. I’d like to see us focus on getting our traffic lights times better, utilizing all the functions of the smart traffic light system that we have, instead of operating it manually, and to take a look at the roads, really, and which areas need just a right turn lane, which ones need a longer right turn lane, so two cars don’t back it up on the main road. I’d like to start from there and then really challenge the traffic department to come up with other common sense, less expensive options than just laying down more pavement, because I don’t think that’s the answer to our issues. We have a great talent base in Frisco, when you look at the skill sets we have. We have a ton of civil engineers with traffic degrees, and traffic minors, and traffic certifications. I’d like to pull them in, and maybe even pull in the community as a whole, and have a community board of people to sit and let’s talk about traffic. What’s bothering people? Because everybody thinks traffic in their neighborhood, or traffic on their street, is the worst. I think it would nice to sit down, and get a bunch of input, and help come up with a strategic, comprehensive plan instead of piecemealing it over time. Scott Ellis: Let’s move on to some other topics. I want this to be also an opportunity for you to talk about things that you’re passionate about and interested in. We know growth is something that is on people’s mind, but what are some other things, that when you look at Frisco, you’re thinking about and wanting to put focus on if you’re on City Council? Brian Livingston: I want to keep it family friendly. I’d like to see more things for our kids to do. I have, like I said, two daughters, who are not into sports. They’re into arts. I’d like to have them have more opportunities and not us having to drive to Plano to get them involved or have them do all their shows, and really let them benefit from all the exciting things in Frisco, as well. I don’t think the City Council and the city should pay for that, but I think they should help encourage it and help the arts community bind together and come up with a good plan that can benefit the city as well. Other things that I’d like to focus on really include helping the Downtown Merchants’ Association, and the retailers down there, come up with something to attract families and allow it to grow. Right now, it’s got some exciting things going on, but I hear a lot of people trying to avoid it because of the limited parking and limited walkability, so I’d like to work with them to help tear down those barriers. Scott Ellis: That sounds good and I know there are a lot of advocates for the arts in Frisco, ourselves included, that are happy to hear you say that. There seems to be a lot of groundswell for people that want to further the arts, but how we go about doing that is, I think, still up in the air, so any leadership in that department would also be very welcome. Scott Ellis: Going into the runoff election, one of the things I want to make sure we get out in front of people is, we know that people have a little bit of fatigue around elections, but the voting locally, voting for people that are on your City Council, I think, is still one of the most important opportunities people have to go out and cast a vote, even beyond the bigger elections, the state and the national elections that take place. I want to encourage everybody. You can get out there, cast that vote. One more time, City Council election. It’s not busy at the polls. You’re not going to stand in line. It’s going to be a very quick in and quick out. It takes two minutes. I believe, and Brian, correct me if I’m mistaken, but right now, the runoff is the only thing on the ballot that’s coming up on June 10, correct? Brian Livingston: Yeah, we’re it. I just voted at Frisco Fire Station #4 at Cotton Gin and Legacy. I walked in and walked out and I was, like you said, a minute maybe. It was very quick. Scott Ellis: Yep. So, early voting has already started, is that correct? Brian Livingston: Yes. It started today and goes through June 6th. Election day is June 10th. Scott Ellis: There you go. We have early voting starting on the 30th, which is today. It’s the day we’re recording. It’s also the day we’re going to publish this podcast. We’re going to turn it around really fast. That is going to go through June 6th, then you got a couple of days of a break, and then we will have the election itself on official election day, if you will, on June 10, which is a Saturday. Get out there and vote. In your own words, Brian, now I want you to tell people why they should vote for Brian Livingston. Brian Livingston: I provide a common sense approach. I like to say small business owners think differently. When we have a problem, we can’t just push it off or blame somebody else. We dig in and we figure out how to solve it, and solve it in a timely manner. I view the City Council as the Board of Directors of the city. It is responsible for setting the tone, the strategy, and the direction of the city, and then helping the City Manager carry it out, and empowering the City Manager to carry it out. I’m the only candidate who’s in the race that’s every actually been on a corporate board. It’s dangerous if a City Councilman tries to get involved in the details and the nitty gritty. Needs to stay above that and help set direction. Again, I’m the only candidate in this election that’s been responsible for a hundred million budget, so day one, I’m going to be the most prepared to tackle the budget and hopefully come in and work with Mayor Cheney and figure out how to lower the tax burden on our citizens. I have the most diverse experience of either candidate. I’ve been a small business owner. I’ve been a commercial banker. I’ve been a CFO of a large company, El Fenix, Snuffer’s, and Meso Maya, responsible for the overall employment and well being of 1,800 people. I think it’s really just overall experience and ability to hit the ground running, day one, and fully understanding what the City Council. It is a Board of Directors. We’re not actually managing the city and needing to know all the minutiae and get involved in that. We need to set the tone, set the strategy, and let the City Manager do his job. I think I’m the most prepared, most equipped, to start day one. Brian Livingston: Thank you very much. Scott Ellis: You bet. Thank you very much for taking the time out to talk to us. I know you’re in the home stretch here and it’s been a long run, so we appreciate the time. Guys, one more time. It’s a quick process. We’re going to post the polling locations so you know where to go vote. You’ll be in and out in no time at all, so please take two minutes, as you’re driving past the polling location, to stop in and cast your vote. Again, Brian, best wishes and we’ll be talking to you, I’m sure, after the election. Brian Livingston: Absolutely. Thank you for the time. Scott Ellis: You bet. Thank you, Brian.